Suitable for 0 - 24 Months. Add a dash of style and colour to your little boy's formal outfit with this burgundy / wine tie with gold pattern, pre tied for the perfect knot every time. 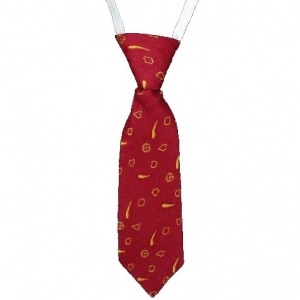 These ties have an elasticated white neckband simply for ease and safety. Suitable for baby / toddler boy's approximately 0 - 24 months (please check measurements). Perfect for a christening, pageboy, weddings or simply any special occasion.